Renewed trade tensions undermined Aussie's recovery. AUD/USD poised to retest yearly lows, escalating trade war to push it even lower. The Australian dollar was among those suffering the most Friday on the back of headlines indicating that US President Trump is willing to put into effect another round of tariffs on China, despite Sec. Mnuchin looking to restart talks with the Asian country. The AUD/USD pair, which traded as high as 0.7228 these days, trimmed most of its weekly gains to finish it at 0.7153. Weekend news suggesting that Trump could announce tariffs on $200B on Chinese goods will likely weigh the Aussie lower. There are no macroeconomic news scheduled in Australia and Japan will be off on holidays, with the pair then likely driven by sentiment. As long as trade tensions between the US and China remain, the AUD has no chances of regaining the upside. 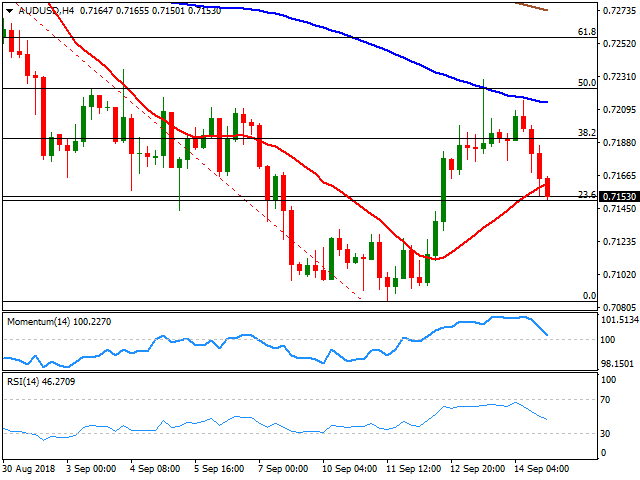 The AUD/USD pair has retreated sharply after testing the 50% retracement of its latest decline, while also faltered two days in-a-row around a bearish 20 DMA, and now barely holds above the 23.6% retracement of the same slide. Technical indicators in the daily chart have stalled their recoveries from oversold readings well into negative territory now gaining downward traction, leaning the risk toward the downside. In the 4 hours chart, the pair met selling interest around a bearish 100 SMA, and settled a few pips below a bullish 20 SMA, while technical indicators head sharply lower, the RSI already at 46, in line with further slides ahead. The bearish potential will likely increase on a break below 0.7130, a short-term static support level.